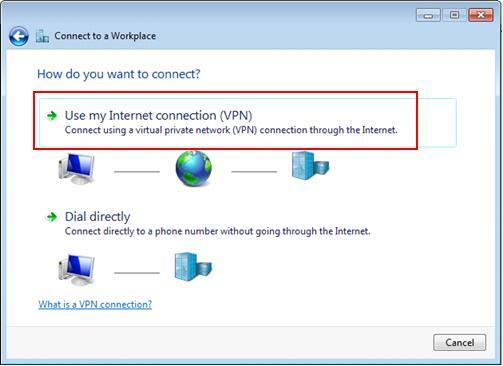 Let’s talk about Windows 7 PPTP VPN client setup in this article, so that you can connect to your home or company’s PPTP VPN server later. 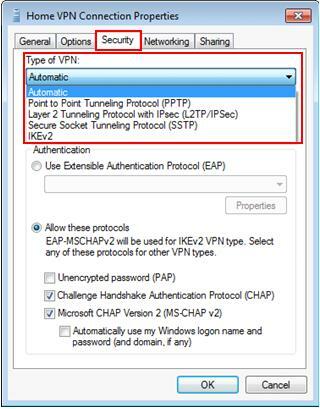 In addition, you can also use this VPN client to connect to VPN server that supports L2TP/IPSec, SSTP or IKEv2 VPN protocol. 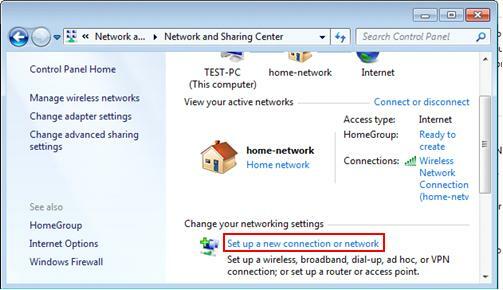 3) Network and Sharing Center window will appear, proceed to click on Set up a new connection or network. 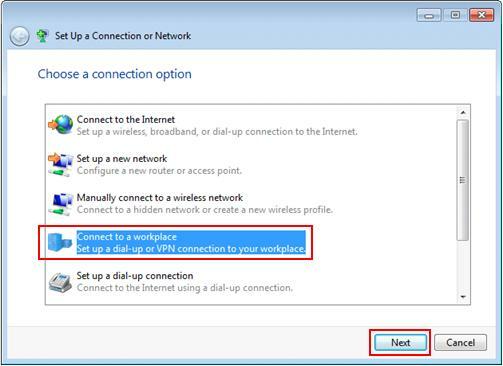 4) Set up a Connection or Network window appears. 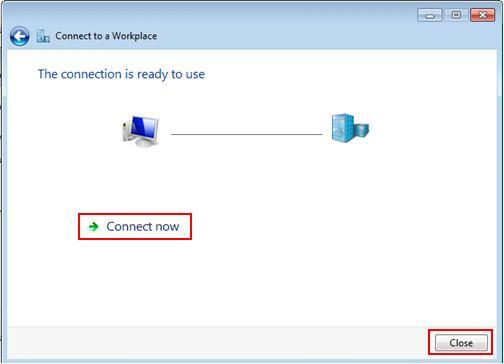 Choose Connect to a workplace option and click Next. 5) Proceed to click on Use my Internet connection (VPN) (your computer should have connected to network). 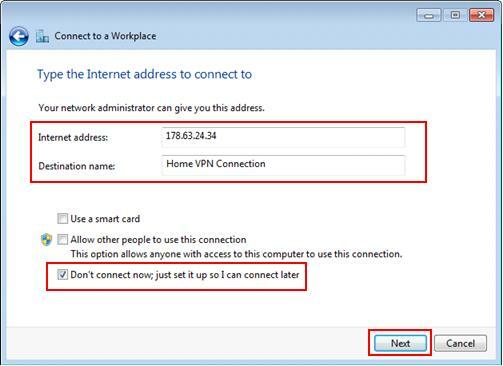 6) Let’s type the IP address or host name of the VPN server computer that you plans to connect to and also name the connection. Most of the time the IP address is the public WAN IP of your home network’s DSL/cable Internet connection if the VPN server is located behind your home router. Click Next. Note: Check this what is my WAN IP article if not too sure about WAN IP of your home network's Internet connection. Note: Tick that Don’t connect now; just set it up so I can connect later option if you are not ready to establish the VPN connection yet. You can also tick other options if it’s applicable. 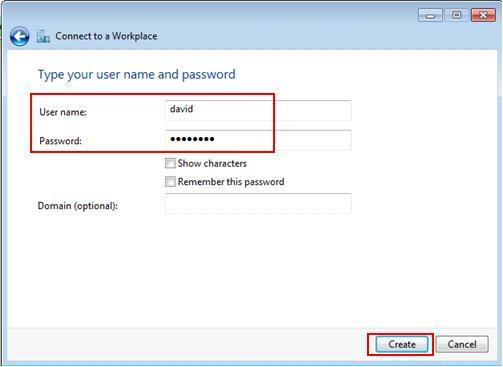 7) Type your VPN user name and password, after that click Create. Note: For safety concern, don’t tick Remember this password option. 8) Ok! Now the VPN connection is ready to use, just click Connect now to establish the VPN connection if you are ready. If not, click Close and connect it later. 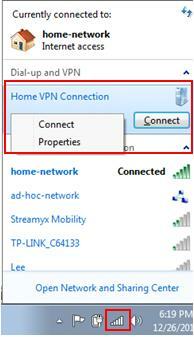 9) If you click on network icon (right hand corner of taskbar area), you will notice that new VPN connection item is created and you can click Connect to establish VPN connection. Note: You can also right click the VPN connection and click on Properties in order to configure this connection in details as needed. 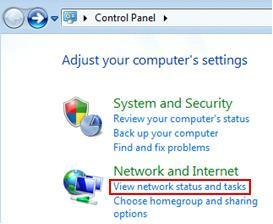 Return to top of "Windows 7 PPTP VPN Client Setup"! !